This quinoa salad, filled with soft roasted carrots, currants and a pomegranate molasses-spiked dressing. Pomegranate molasses isn't really molasses, but a pomegranate syrup. I've included a recipe to make your own in this menu. Dovetailing tip: Grab your prepared carrot coins from the fridge to use in the Quinoa Salad. Prep time saved! Cut leek in half lengthwise and rinse away any grit. Slice thinly. In a small skillet over medium heat, warm 1/4 inch olive oil. Add a handful of leeks and fry until golden brown, 15 to 30 seconds. Remove with a slotted spoon and transfer to a paper-towel-lined plate. Sprinkle lightly with salt. Repeat with remaining leeks. In a small bowl, whisk together lemon juice, molasses, 1 teaspoon salt and a large pinch of pepper. Whisk in 3/4 cup oil. Heat oven to 425 degrees. Toss carrots with 2 tablespoons oil, 1 teaspoon salt and some pepper. Spread on one or two large baking sheets so they fit in one layer. Roast carrots, tossing occasionally, until tender and golden brown, 30 to 35 minutes. While carrots roast, bring a large pot of salted water to a boil. Add quinoa and cook until tender, 10 to 12 minutes. Drain. In a large bowl, toss warm quinoa with currants. Add carrots and half the dressing and toss well. Taste and add dressing or salt (or both) if needed. 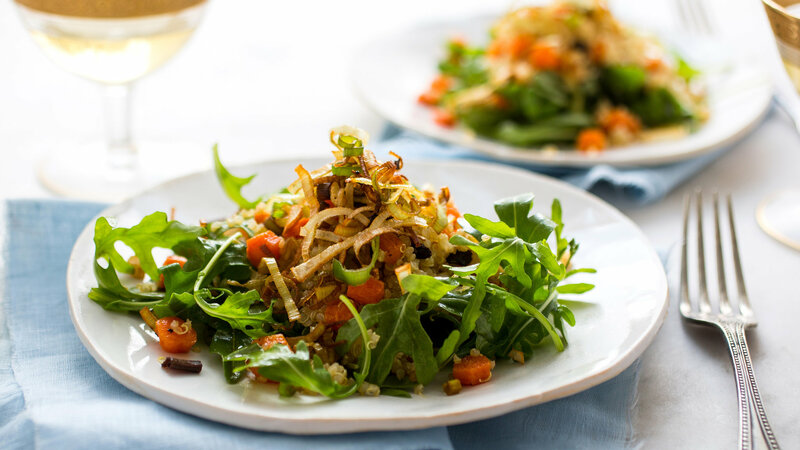 In a separate bowl, toss arugula with enough dressing to lightly coat. (Leftover dressing will last for five days stored in the refrigerator.) Spread arugula on a serving platter. Top with quinoa and the frizzled leeks. Drizzle with more pomegranate molasses and a little olive oil before serving.